What Is the Proper Height for a Built-In Fire Pit? One way to enjoy the great outdoors in your own back yard is to build a fire pit out of stone, brick, or concrete blocks that are made to look like natural stone. Relaxing by an outdoor fire with family and friends on a cool evening is one of the great benefits of taking on this project. Before starting construction on your fire pit, check first with your local codes and bylaws regarding having an open fire in your back yard. In some places, an open fire is allowed if it is covered by a grate. Other places have no such regulations, or may not allow open fires at all. To avoid problems down the road, know what is permissible in your area. When deciding where to build your fire pit, make sure it will be well clear of overhanging trees, power lines, buildings, or flammable vegetation or structures. Also make sure your fire pit is set far enough away from your neighbor's homes, so that they will not be affected by smoke or sparks. Generally, a good inside diameter for a fire pit is 36 to 44 inches. When marking out the area where you want to build your fire pit, allow for the outside diameter of the circle. Cut the circle out of the soil or sod using a shovel, and dig down to a depth of about 6 inches. Dig down further if you want to build the firepit on a base of sand or gravel to provide stability and drainage. 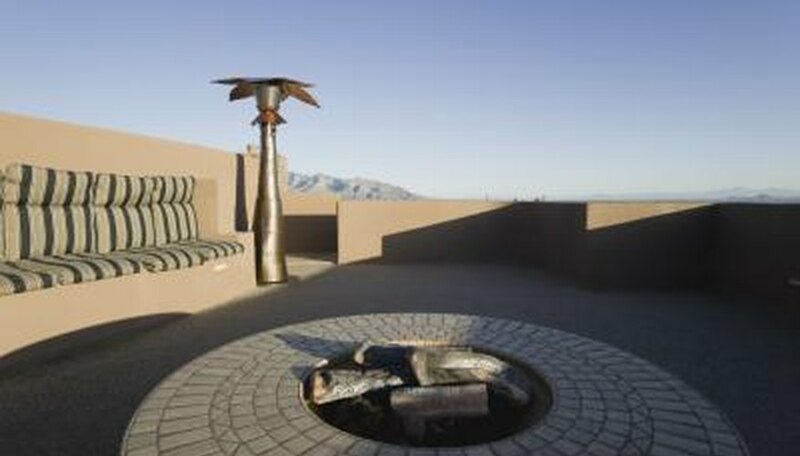 The idea of a fire pit is to provide warmth, and if walls are too high, it can be difficult to feel any warmth from the fire, or to see the flames. A good rule of thumb is to build the walls up no higher than about 1 foot high. Your first row of bricks or blocks should sink into the ground about 6 inches to provide stability. If you are using bricks, you will need four or five layers to reach the proper height. If you are using 6-inch stones or concrete blocks, two or three layers should be high enough.